I live just outside of Philadelphia, Pennsylvania. My style is bold and bohemian with a natural feel. I like things that look easy and flowing with dashes of detail, style and spice. I use bold colors, polished metal and bits of sparkle. Art Deco is one of my favorite style genres because it appeals to my geometric side and to my liking for strong colors. My parents were always antique shopping when I was young, so I have always had lots of finely crafted objects around for inspiration. I look to unexpected places for inspiration, like the guts of a broken watch, or a crazy looking seed pod that I noticed while hiking. I always have pocketfuls of random tiny objects that I have recently discovered. I like to keep them around for a while. Sometimes they end up in a piece, sometimes they just amuse me. My biggest inspirations as artists are Hokusai, Erte and Alan Revere. A great gemstone can be all of the inspiration needed for a great piece. Picture jasper is so often a work of art on its own. I also love crazy lace agate and druzies. I am so amazed at the tiny wonders that we manage to dig out of the earth! I have always had a fascination with stones and metal. I work both in silver and gold. Each metal has a personality all of its own. Silver is so sensitive to touch. It is ideal for forging elegant curves with hammers because it is so soft. Gold is much more tenacious, but solders quickly, and takes a mirror shine beyond comparison. 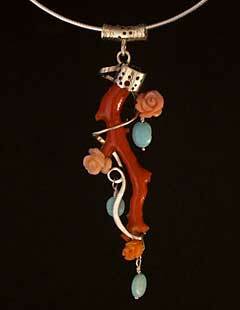 It is a modern twist on the classic Southwestern jewelry materials, coral and turquoise. While I sketch some pieces, I began this with just a coral branch. When I began forging the silver, it made its own path around the branch. I compared the silver with the branch every so often and made spot decisions about which way to make it turn. Finally, the silver had to keep the branch in place. When that was completed, it was a small matter of building tiny settings for the roses, deciding where to place the turquoise and how to hang the pendant from a chain. It depends how far in the past you look. I remember selling friendship bracelets on the playground in the fourth grade. I think it became pretty serious for me in high school when I took a jewelry class and learned to work with metal. When they put a torch in my hand, my fate was sealed. I have a Bachelors of Fine Arts from Tyler School of Art at Temple University. I have always enjoyed drawing, sewing and other fiber arts as a hobby. 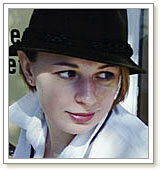 Perhaps my opportunity to try different things influenced my jewelry while I was in school. My second cousin gave me her old catalog when I was a teenager. I remember going through every page making my wish list. I like to travel. A two month adventure across the country was a big inspiration to some of my work. I also like to sew, read and write. I think it is important for an artist to keep alive a diversity of creative outlets. It opens the mind and leads to inventiveness. 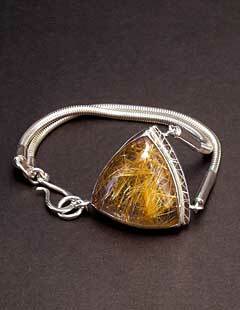 Jewelry-making is a full-time career for me. I always felt that it was important to do what you love, and worry about getting paid later. I wake up every day excited to go to my studio and design or create. Being a metalsmith is, of course, tough on my hands. Sometimes I need to rest them when I get home, but I take good care of my body to make sure that I can keep doing this for years to come. Perhaps my art is in some ways motivation for me to take good care of myself. Please check out my website www.LayneDesigns.com. I have a gallery with some one-of-a-kind pieces, some of them are sold, some for sale, and many have been commissions for custom work. I have a fan-base started on my business Facebook, www.facebook.com/LayneDesigns. I also have an Etsy shop: www.laynedesigns.etsy.com. More recently I have started doing home party trunk shows. They have been a lot of fun, and good for sales. I am applying to some big art/craft fairs this year, so wish me luck! I have given to Kiva, an organization for people to lend money to impoverished entrepreneurs who wish to better their situation by starting their own business. Try not to lose the wonderment that you felt when you started. We should all remain so open to new ideas as we were when we started our very first project. Be willing to experiment and even fail to open the doors to something new. Also, have quality standards. Jewelry gets worn hard, and it really matters if yours holds up.